One of my favorite things to do when I volunteer at wineries is harvest (I said ONE of…!!). 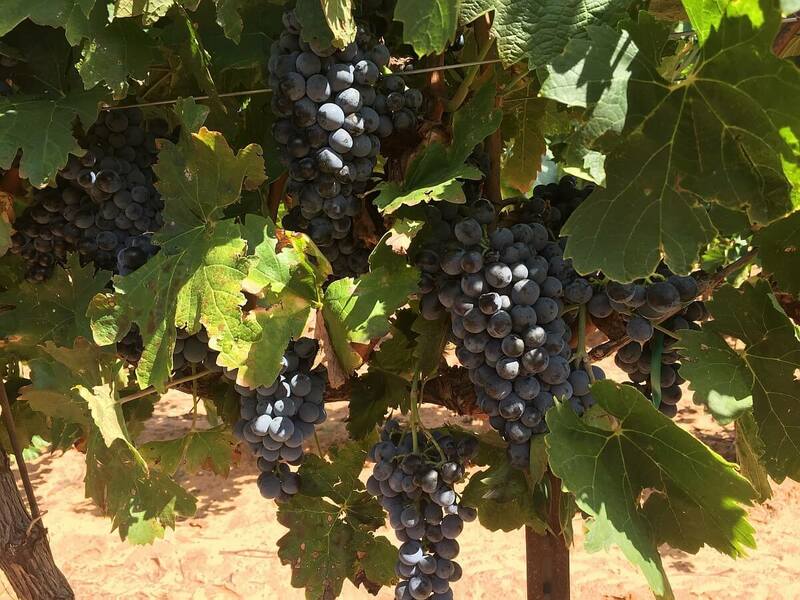 I just love to see the grapes at their best ready to be plucked off the vine and sent on their way to where they can be made into some potentially award winning wines. This summer I participated in several hand harvests and one machine harvest. What this did was whet my appetite and made me want to do more. Many harvests that I’d find out about were at times that I couldn’t get there. 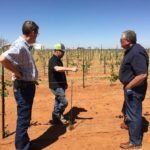 So I came up with a plan to head out to the grape growing Mecca of Texas – Brownfield, Terry County on the High Plains – in order to see harvest happen in person on a grand scale. I made connections and hotel reservations for Labor Day weekend. As the time for our trip neared, I became more aware of the weather forecast. The High Plains had been experiencing a very wet weather pattern considering it was August, and it was promised in the long-range forecast for our travel weekend as well. I almost cancelled the trip, but I decided if we got rained out, there were friends still to visit. We left after work Friday evening knowing it would be an almost five-hour trip. We arrived at the Holiday Inn Express in Brownfield at about 11:15 p.m. that night. 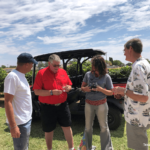 Our first “appointment” Saturday morning was with my dear friends Bill and Gail Day at their Buena Suerte Vineyards. We arrived after doing some sand mudding in my Ford Edge and drove between very lush sections of grape vines. We pulled up to find Bill piddling outside waiting for us. We were greeted with big hugs and hearty handshakes, and he took us inside where we found his lovely wife Gail. We exchanged more hugs and stepped outside to the front porch to visit over peach Bellinis. We caught up on news and they told us more of their grape growing story. 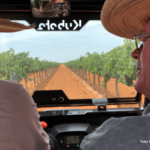 After a bit, we got into their four-wheel drive cart and they took us on a personal tour of the vineyard. They pointed out the varieties they had planted. We would stop and take pictures and taste the grapes. While they do not all taste the same, I certainly cannot differentiate between their flavors. It is very interesting to see the change in size and shape and even color of the grape leaves between the varieties. The size and cluster shape of the grapes also changed between varieties. Bill was ever so patient and thorough in answering my questions. We also went outside his anti-deer high fence to check out his other crop—peanuts. 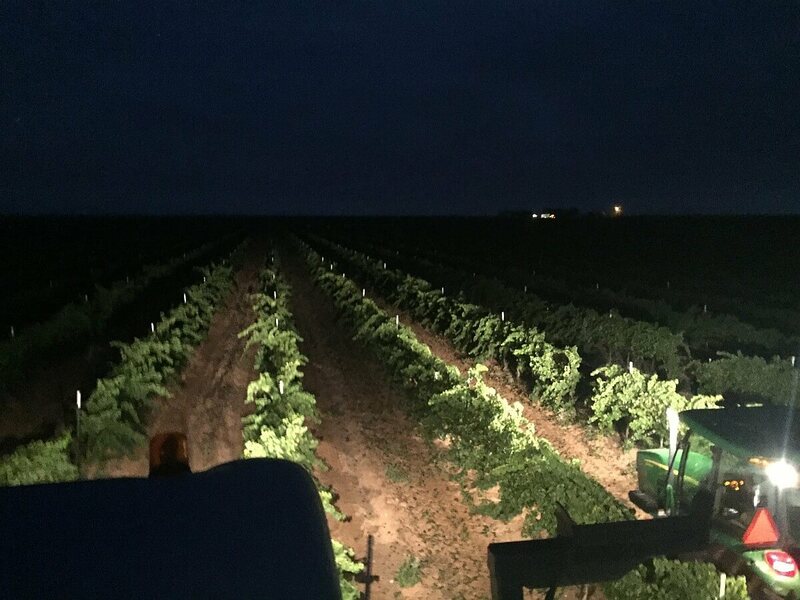 So many grape growers have found out that grapes take much less water to farm than their first row crops of peanuts and cotton. 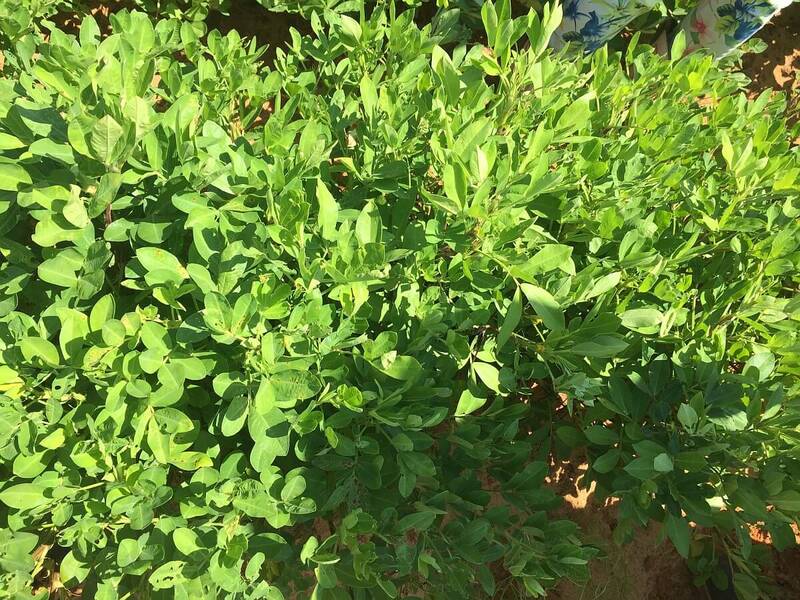 The peanuts were beginning to bloom and show signs of dropping their tendrils down to the red sand. Bill was telling us of one summer that the temperatures made the sand so hot that it basically baked the tendrils as they dropped into the sand. Their peanut crop was very slim that year. 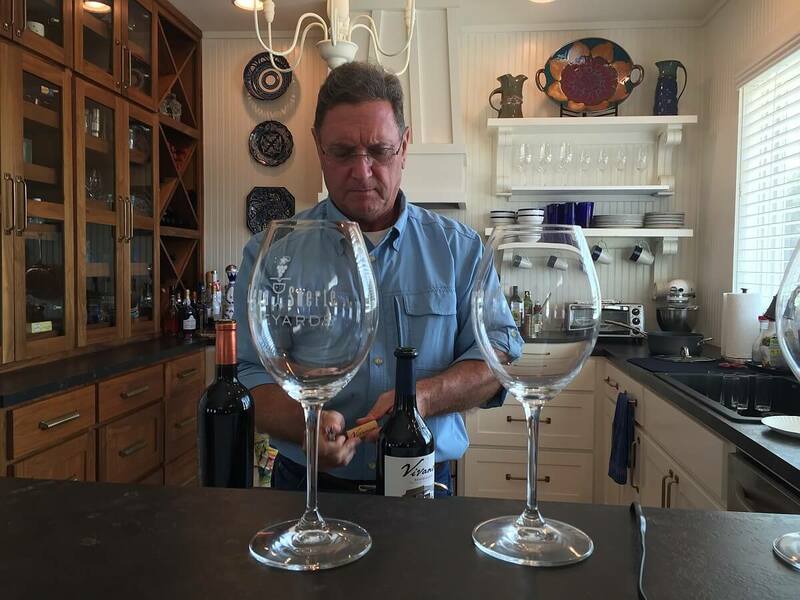 We made our way back to the house where Bill threw some burgers on the grill while Gail and I finished the final burger preparations and made our wine selections. We chose a Pedernales 2012 Tempranillo and a Vivanco Rioja Reserva. These were lovely with our grass fed beef hamburgers. We followed lunch with Licor 43, a Spanish citrus liqueur. I wasn’t too sure I would like this, but as I’ve learned on so many of our excursions—TRY EVERYTHING!!!! I am so very glad I did. Now I will need to go on a treasure hunt to liquor stores to find this luscious elixir! Following lunch, we drove the whopping 1 ½ miles down the road to the vineyard headquarters of Farmhouse Vineyards co-headed by Nicholas and Katy Jane Seaton. Nick was out and about working the vineyards while Katy Jane was hanging out at headquarters awaiting the young Prince McClain to awaken from his afternoon nap. While we waited with her, we had a lovely visit talking about their vineyards, their grapes and where they end up, got to preview their new wine label (it is pretty cool by the way! 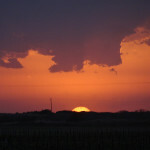 ), all while enjoying a bottle of Becker Vineyards’ Jolie Rosé which is made with the grapes from Farmhouse Vineyards. Once the young prince awoke and had a quick post-nap snack, we loaded in our vehicles and ventured out to visit the three locations of their vineyards. Each was just as green and lush and grape laden as the next. We ran into Nicholas at the final vineyard location in Brownfield. He had been spraying for any kind of rot, which occurs when there is too much moisture caused by rain. They have had way too much rain way too close to harvest this year, and it doesn’t look like it is going to have many dry spells to offer either. After quick hugs/handshakes and Nicholas snuzzling with his precious prince, we said our good-byes and thank you’s to Katy Jane as she and McClain loaded up and headed back home to await the arrival of more friends for a quiet dinner and much needed visit. However, before that could happen and in true Seaton-drama-style, it was noticed that a neighbor cow had been able to make her entry into their vineyard and had been enjoying some of their fruits. It didn’t take Nicholas long to get her back where she belonged and the closure tightened to avoid that from happening again. Again, good-byes were said and off we all went our different ways. I texted my dear friend and vineyard owner Jet Wilmeth of Diamante Doble Vineyard to see if we could meet for dinner. Luckily he and his lovely wife, Gay, were available and he suggested a local Japanese hibachi grill restaurant and we met them there. It was easily some of the best hibachi that we have had, and to think it was in the little high plains town of Brownfield!! 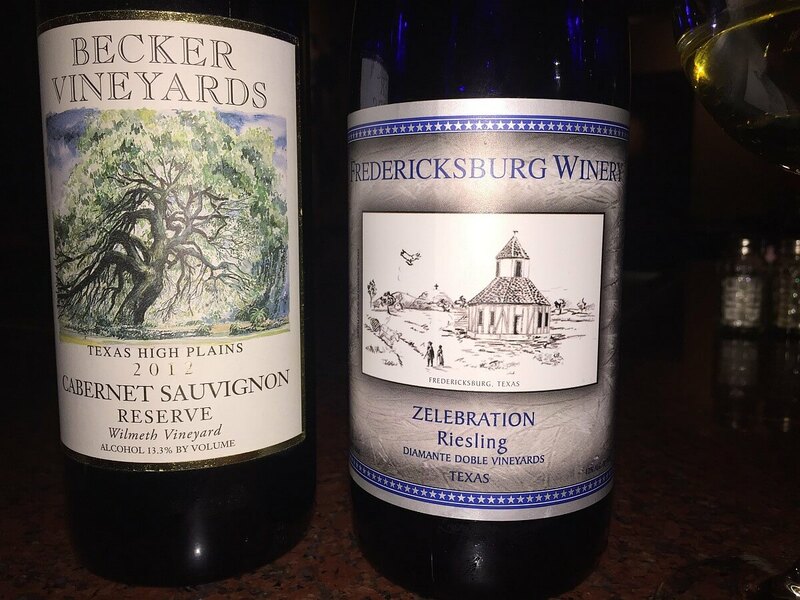 Jet brought a couple of wines to share from his vineyard; one was Becker Vineyards 2012 Cabernet Sauvignon Reserve from Wilmeth Vineyard. I happen to have two of these lovely bottles in my collection and I was very excited to see how it was holding up to know if I need to drink mine soon or can I hold it a little longer. Oh yeah…hold it, baby!! As yummy as it is now…I can hold it a little longer, if my patience holds out! We stayed after dinner and visited until they were about to lock us inside. I found out the next harvest at Diamante Doble was overnight Sunday/Monday and we made plans to be there. We departed to our hotel and enjoyed a very restful night after an incredibly exhausting day! Sunday was a very quiet day spent resting and relaxing as we toured the county’s vineyards while using the Texas Wine Lover’s vineyard map. We found big name vineyards like Lost Draw Vineyards after turning around once and going in a different direction due to impassable muddy road conditions. Not too far up the road, we saw Vijay Reddy’s Reddy Vineyards. We found some that were too new to be on the map. 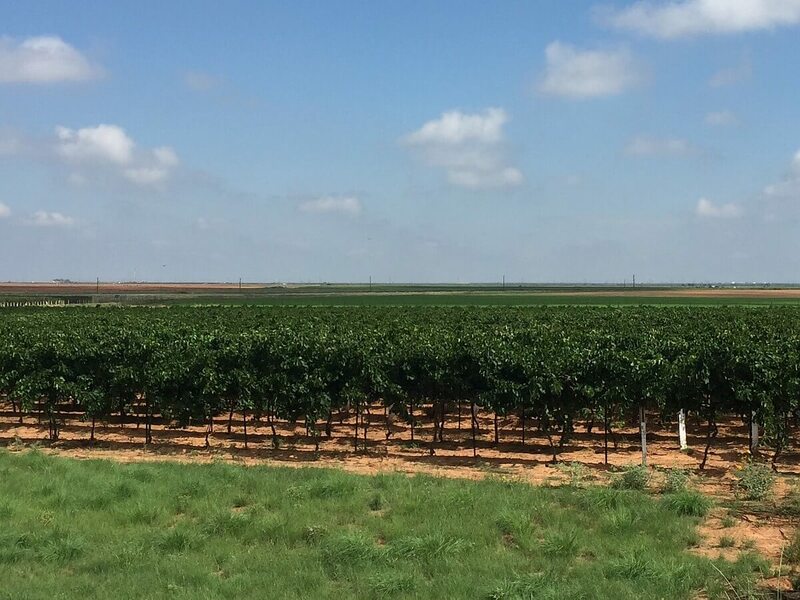 (Editor’s note: Texas Wine Lover wants to get EVERY Texas vineyard listed, so if you own one that is not here, please let us know) We made our way back to town to try to find some lunch and maybe head back to the hotel for an afternoon nap. 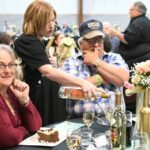 I hated to be this close to Plains without making the effort to see Neal and Janice Newsom at their home at Newsom Vineyards. So I made a quick contact to see if they were available and luckily they were. We ran out there and Janice told me that her brother and his crew were machine harvesting Chardonnay for Becker Vineyards at Canada Family Vineyard. We made our way out west a little farther—we were just a stone’s throw from New Mexico by now—where we found Janice’s brother and his wife with their heads in the bins as they removed the inevitable leaves and stems as the machine harvester poured the freshly picked grapes in the bins. 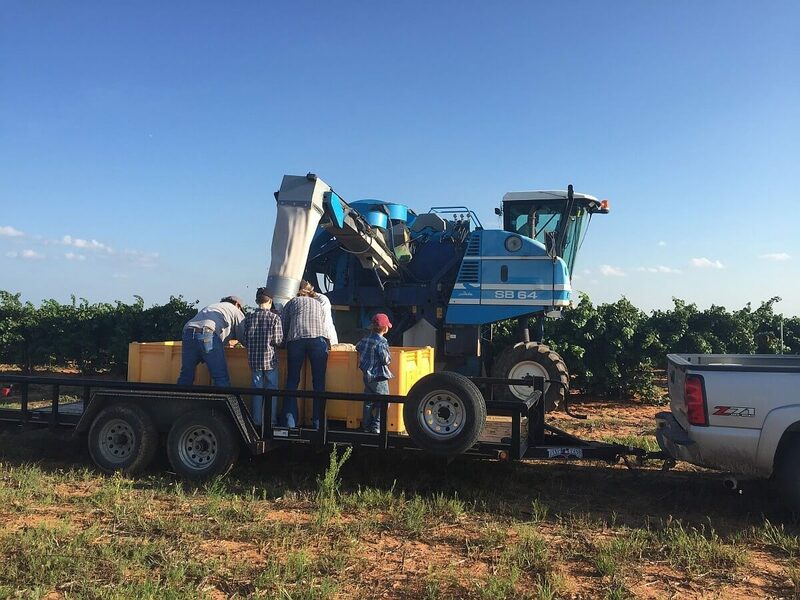 Such a great experience to witness these iconic grapes as they begin their trip to becoming a potential award winning Texas wine! We left prior to sunset as I wanted to be sure and visit the Newsom’s vineyards while they still had grapes on the vine. The last time we were in Plains to visit the Newsoms was in July 2013 following a very harsh late winter/spring that ended up ruining their whole crop that year. It was beautiful to see the vines so lush and green, and the grapes hanging so perfectly this time. Neal drove us around their many acres of vines and pointed out the different varieties as we passed. He would stop and let me out to take photos and taste the various grapes. They were so full and so pretty. By this time of year, most of the whites had already been harvested or were on their final leg, and so mostly what was hanging was the red varietals. And in true west Texas farmer fashion, he was also very patient and thorough as he answered my myriad of questions. We made our way back to the house where Janice put together a quick cheese and cracker snack and we added what we had brought. It was a perfect way to watch the sun set and the moon rise across the west Texas horizon. 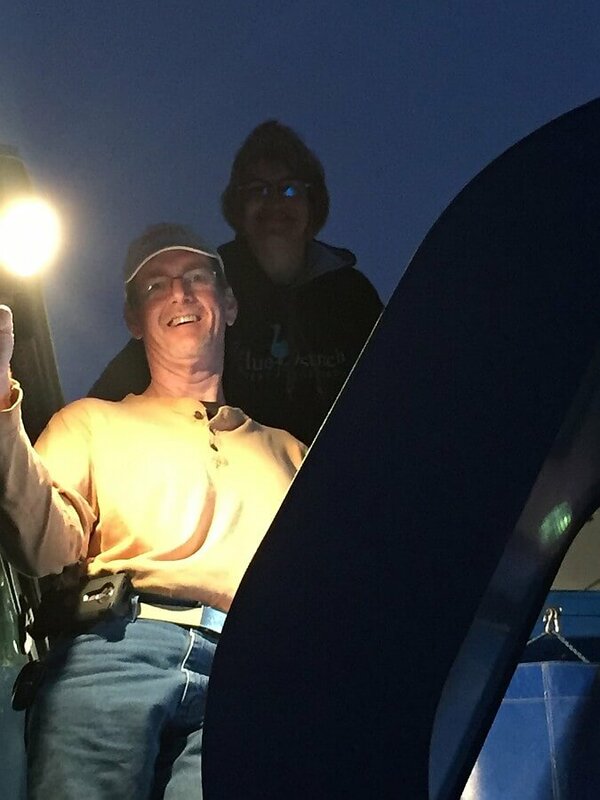 Neal is an admitted science geek and he found the satellite schedule and we watched for one of the largest communications satellite as it raced across the sky. 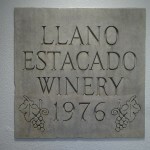 We enjoyed a wonderful visit catching up on life and the Texas wine industry. We left as they are active farmers and their days start much earlier than ours while we are on vacation. However, we were immersing ourselves in the harvest events and that included overnight harvests. We had found out from Jet that harvest would be happening at his vineyard, Diamante Doble, the next morning at 3:00 a.m. I was pretty sure they could start without us. We did wake up and get out there early enough to catch the second semi-truck as it made its way to the vineyard. We found Gay and Jet’s brother Ty (who has started his own vineyard next door called Diamante Doble Dos!) and many others as they each did their job participating in the harvest. It wasn’t long before Jet arrived and had Shelly and I hop into his truck and he took us over to where the harvester was running the rows. When it came to our end and turned to head back the other direction, we hitched a ride and had a bird’s eye view from the top of the harvester. 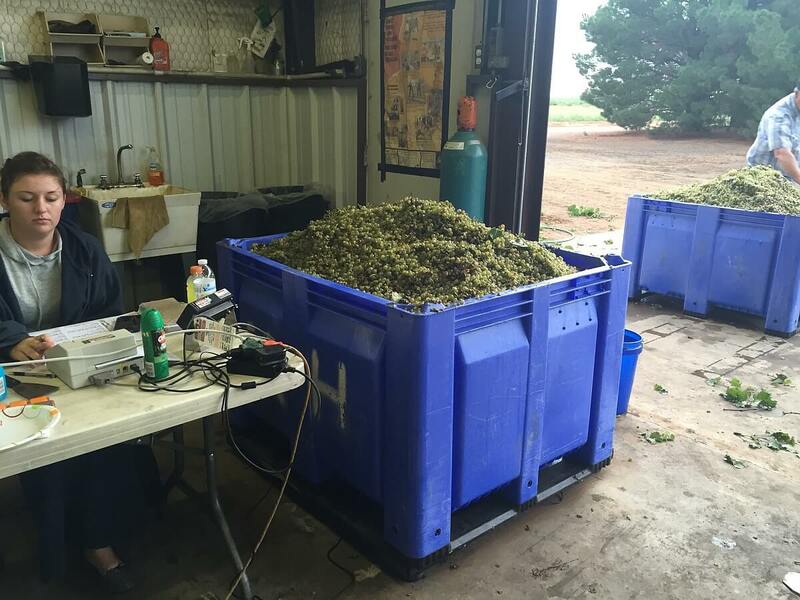 This particular harvest was Riesling headed for Messina Hof Winery in Bryan. 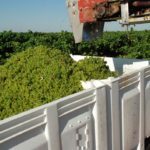 The rows are about half a mile long and the machine straddles the row and shakes the vines pretty violently which makes the grapes fall off and are carried over to the chute where they are poured into bins on a wagon being pulled by a tractor. The tractor driver has to be very careful to keep the correct pace with the harvester so the grapes go in the right bin and not the one that is full or (gasp!) over the side! Jet was waiting for us at the end of the row so he could take us on a quick tour of his grapes since it was getting light by now. Unfortunately clouds had arrived so we were denied a sunrise over the vineyard. By the time we got back to the barn, several more loads of Riesling had arrived, been weighed and labeled, and staged to go on the semi-trailer to go to Messina Hof. One of the fellows driving the forklift was none other than Jeremy Nelson, owner of Soleado Vineyards. No better way to learn all the ins and outs of vineyard ownership and management than hanging out with Jet Wilmeth! We knew we had to leave by 9:30 a.m. so we could make it back to the hotel to get cleaned up and checked out and on our way back home, but we got to see the first load of Riesling come in to be loaded up to go to Lost Oak Winery. What a perfect way to spend a long weekend. A wonderful combination of friends, harvest, and wine. 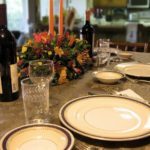 Raise a Glass for Thanksgiving!